Last year the Faculty of Management decided to host the first Slovenian Moodle conference (also known as a MoodleMoot) to bring together users, developers and administrators of Moodle, one of the most popular online learning management systems in Slovenia. 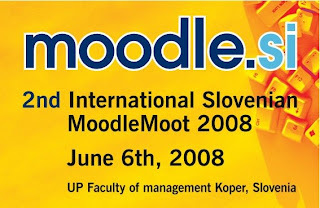 This year we decided to make the Slovenian MoodleMoot international and invite Moodle enthusiast from all over the world to share their Moodle experience and meet with Slovenian Moodle fans. The 2nd Slovenian MoodleMoot will feature several presentations from Slovenian users, but also a real life and a virtual international section in English. The international section will be broadcasted into the virtual world of Second Life. special requirements for the presentation (if any). Presentations should be limited to 15 minutes. You can attend the international section of the conference for free either in real life in the sunny coastal city of Koper, Slovenia or in the virtual world of Second Life (exact location to be announced). If you plan on attending the conference in Koper, Slovenia, we ask you to announce your attendance by May 31st at cei@fm-kp.si. Second Life attendance does not require prior registration. We expect the international section to be scheduled at 5 PM CET (8 AM SLT) on Friday, June 6th, 2008. You can send additional questions about the conference at cei@fm-kp.si or post them on the conference Moodle site. For additional information about presenting in Second Life, you can also contact Alja Sulčič (SL iAlja Writer) directly in Second Life or through e-mail (alja@artesia.si). The conference is organized by the Centre for e-learning at the Faculty of Management Koper in collaboration with Artesia, Open Source Center Slovenia, and National School for Leadership in Education.